I grew up watching my dad get up each morning and tuck himself in the back room of our home. He left early for work, since he had a bit of a commute, but that didn’t stop him from getting up even earlier to meet with the Lord. For years I watched Him prioritize his devotional time, so I guess it’s no surprise I picked up on the habit. My love for the Bible started early and I was probably eight or so when I read through the Bible for the first time. Okay, so it was a children’s Bible and the pictures took up more space on the pages than the words did, but I poured through that book in forty-eight hours flat and found myself captivated by the stories. I was in middle school the next time I made an effort to read through the Bible again–a big-girl Bible this time. As part of his routine, my dad worked through a reading plan that took him through the entire Bible in one year, and I wanted to give it a shot. Each day I pulled out the reading plan, flipped to that day’s passage, then checked off the box when I was finished. Over the years my devotional time has taken on different shapes, but the habit has remained. It wasn’t until college, however, that my devotional time got a little more personal, a little more intimate. For a long time I had seen reading my Bible as something every “good Christian” had to do, and rule-follower that I am, I wanted to make sure I was doing this whole Christian-thing right. But during college, when I was out from under my parents’ roof, I found myself grappling to find my own faith. I never doubted God’s existence or His love for me, but the habits I had developed during my growing up years, those I was questioning. Just because my dad read the Bible a certain way, didn’t mean I had to. So I let go of the traditional reading plan and tried out different ways to spend my devotional time. It was also during that year that Jesus met me in a really personal way through a book called, Authentic Beauty*. Like most girls, I dreamed of getting swept off my feet by a handsome man who would one day be my husband, but I found myself painfully alone. I watched other freshman girls pair up with their peers and I battled hard with the feeling of rejection. That book, and another one my small group went through called Captivating*, met me in my loneliness and showed me in a much deeper way just how much God loved me and wanted to spend time with me. That year Jesus pressed in close and whispered to my heart that He was the One I was waiting for, longing for. He was the one who would be able to fill my heart and meet all those desires for love and companionship and closeness I had hoped to find in a guy. That year Jesus completely changed my life and my view about my relationship with Him and the time I spent with Him. If we’re honest, I’m sure many of us in the Christian church would say that our devotional time is something we feel like we have to do. But the truth of it all is, this daily time with the Lord is meant to be so much more. 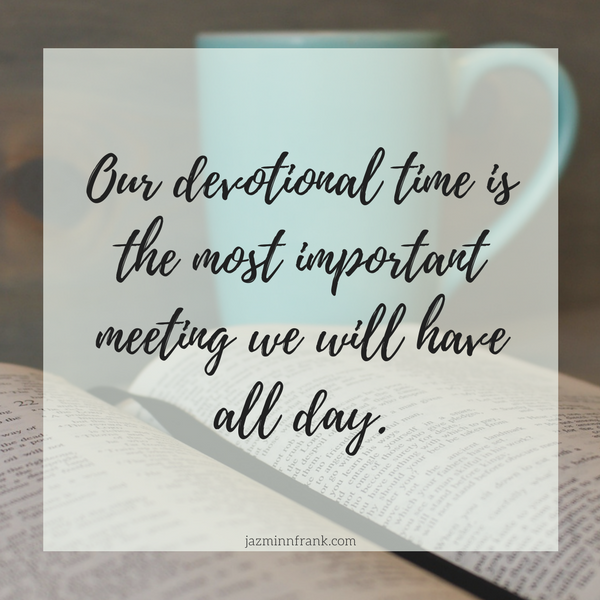 In fact, our devotional time is the most important meeting we will have all day. Like any relationship, our relationship with God requires time and effort. When I realized that God was near and wanted to spend time with me, just like a friend would, I found myself setting times to meet with Him in the same way I added an outing with a friend to my calendar. During that year when God starting shaking up my view of our relationship, I started something I called Jesus-dates. When classes got out at 4:20, I’d head back to my room and snuggle up on my thin dorm mattress with my journal, my mp3 player, and my Bible. Some days I would just lie there and cry as I listened to worship music because that day had been really hard; sometimes I’d pour through a few psalms; and sometimes I’d dump out all the contents of my heart on my journal pages. Every day it looked a little different, but every day I made the effort to meet with the Lord in some way. David writes in Psalm 84:10 “For a day in your courts is better than a thousand elsewhere.” One day in God’s church, one moment in His presence, one hour spent reading His word is better than being anywhere else with anyone else. The more time we spend with God, the better we get to know Him, the better able we are to discern His voice and recognize His presence. In God’s presence we find all we need to get through the day, even the hardest ones. In His presence we are reminded that no matter what the world says, we are loved and cherished and treasured by the One who made us and knows us best. In His presence we find the strength to keep moving forward because God’s word tells us multiple times that we are not alone. Devotional time is essential to growing our relationship with God, but it also helps us place our lives on a solid foundation and center our day around truth. Whether you’ve been meeting with God for years or this whole idea of spending time with Him is completely new to you, I want to challenge you to make this time a priority in your life. There are a lot of ideas out there about how this time can and should be spent, but you are free to find what works for you. Don’t feel like you need to fit some mold. You don’t have to have your devotions at a certain time of day or read X amount of chapters in the Bible. There’s no expectation for how often or how long you have to pray. This time is entirely up to you and God. It’s personal and unique to your relationship with Him. Make it a habit. I have a friend I meet with every other Friday for an outing we call Donut-Day. Sometimes it involves chocolate donuts, sometimes we choose Mexican food instead, but it’s something we intentionally add to our calendar and look forward to. Our time with the Lord is no different. Develop the routine of meeting with God at a certain time each day. Schedule the time and protect it. For me, I like having my devotional time in the morning. I find I focus better in the mornings, and meeting with Him first helps set the tone for the day. So set aside the distractions, put your to-do list on hold, and just show up even on those days you’d really don’t want to. Making the effort will help you develop the habit, until this time becomes second nature. Do what you can. Whether you have five minutes or five hours, commit to spending some amount of time with God. Whether you read one verse or ten chapters, just meet with Him. Also recognize that seasons change and your devotional life will look different in different seasons. Whatever shape it takes, in whatever season you’re in, know that all God expects is for you to show up with an open heart. Shake things up occasionally. While it’s important to develop the habit of keeping devotional time, sometimes we can get too caught up in the routine that we miss the relationship. If you feel this happening–if you’re excitement or desire to prioritize this time starts waning–don’t give it up entirely, just find new ways to spend that time. There are so many different ways we can connect with God outside of the usual Bible reading plans and prayer journals. In fact, this last one matters so much to me, that I wanted to give you some new ideas for your devotional time that you may not have considered before. That’s why I created the 10 Day Devotional challenge. 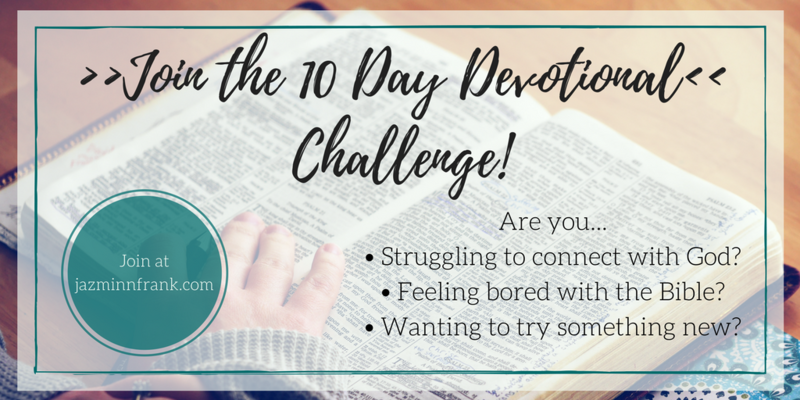 This free challenge is all about helping you connect with God in new ways and revive your devotional life if things are feeling kind of blah. Each day of this challenge you will get an encouraging email with a new idea to try and some ways to incorporate it into your current routine. 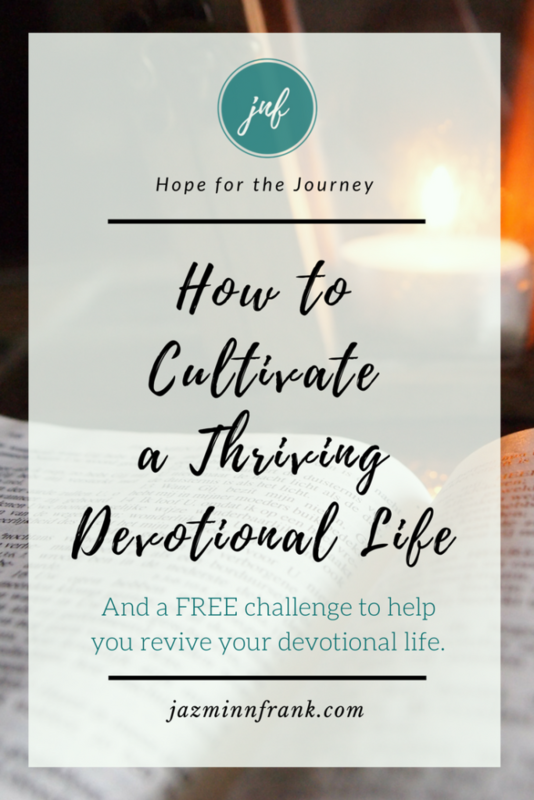 If you’re devotional life could use a breath of new life, sign up now and join the challenge! How do you like spending your devotional time? What do you struggle with most in making your devotions a priority? Love this post Jazmin! I so agree with you. My devotional time has evolved a good bit. One of the things I most enjoy is delving deeper into the Word rather than trying to push through a plan for quantity.I have done that and I think having a grasp on the “big picture” and the “whole story” is very important, but after doing that for a long time, I wanted a more intimate time with Him with journal in hand. I am currently reading The Burning Word by Judith Kunst that you might find of interest.